Maven is a comprehensive build system for Java projects. A lot of people, including myself, have a love/hate relationship with Maven. The reasons for this relationship can be discussed at another time. In any case, used judiciously, it can make managing dependencies in Java projects much easier than handling them by hand. 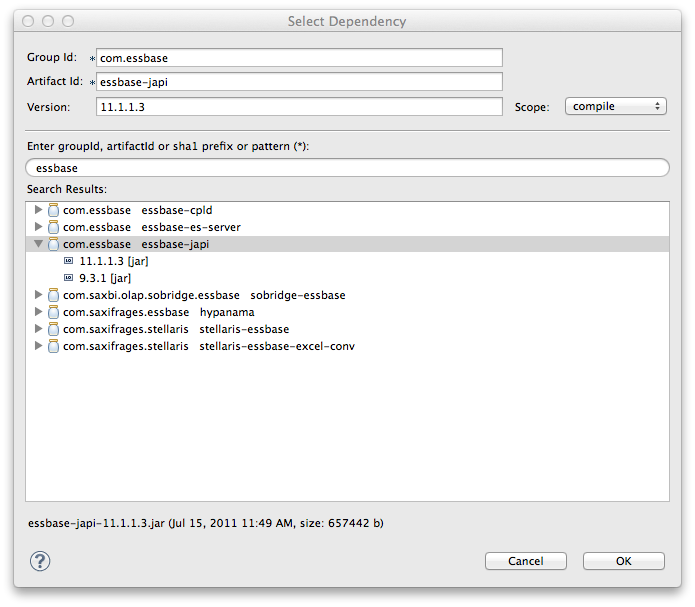 Eclipse has pretty good Maven integration. It’s possible to setup a new project and browse for dependencies and add them automatically to your project. Everything just works. I develop quite a few Java applications that rely on the Essbase Java API, so I have imported the Essbase jar files to my local repository (since they are not available from a central public repository) to make development a breeze. Here’s how you can do the same. First, you need to go get your Essbase jar file. These are installed on the Hyperion server. You might have to search around a little bit since the directories seem to change from release to release, but in the case of this stock Hyperion 9.3.1 server (with Hyperion installed in C:\Hyperion) they can be found at C:\Hyperion\AnalyticProviderServices\lib. Right now we’re just interested in the ess_japi.jar file. We’re going to import this in to our local machine’s Maven repository. This assumes you have Maven installed locally, of course. If not it’s pretty straightforward. Just Google around and all will be clear. Maven is very particular about the versions of everything. It allows you to store multiple versions of files. This means that our single repository can store the files for Essbase 9.3.1, 11.1.1.1.0, 11.1.1.3, and so on, all next to each other. Since we’re importing this resource manually we are going to tell it the version. 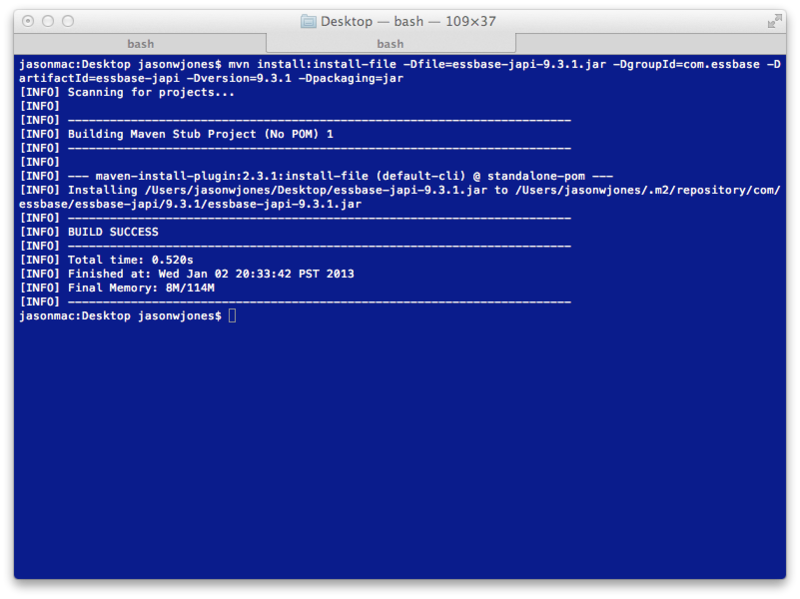 First though, let’s rename this local file to something more consistent with Maven naming conventions. Let’s rename it from ess_japi.jar to essbase-japi-9.3.1.jar (since this is a file from a 9.3.1 server). Change it accordingly for other versions. If this were 11.1.1.3 then we would make it essbase-japi-11.1.1.3.jar. Note that Maven “prefers” a versioning scheme of major.minor.revision but not all software (particularly Essbase) adheres to this, so we’ll do our best. 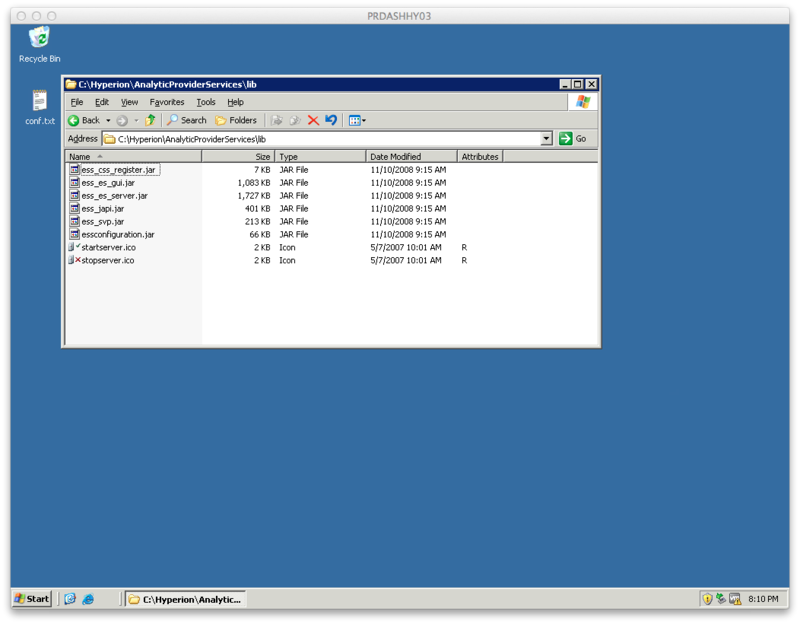 Each -D indicates a parameter we are filling out: the name of the file, a Maven group ID (which we’ll decide to make com.essbase), what the name of the artifact itself should be (essbase-japi), the version, and lastly that it is a jar file. You’d think Maven could infer some of this for us but we only have to do this once in a blue moon so it’s not so bad. 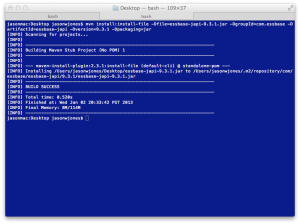 Maven will copy the file to the local repository. 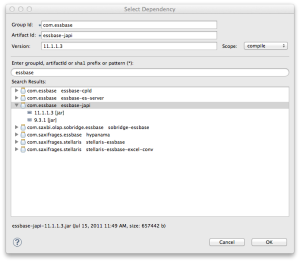 To make it visible from Eclipse you will likely have to rebuild your Maven repository index which is no big deal. Now we’re good to go. We can easily include this artifact in future projects quickly and easily. This is particularly useful if you happen to download the source code for some of my Essbase-related open source projects, which as of late rely on Maven for dependency management. Survey Results: What is the one true MaxL script file extension to rule them all?